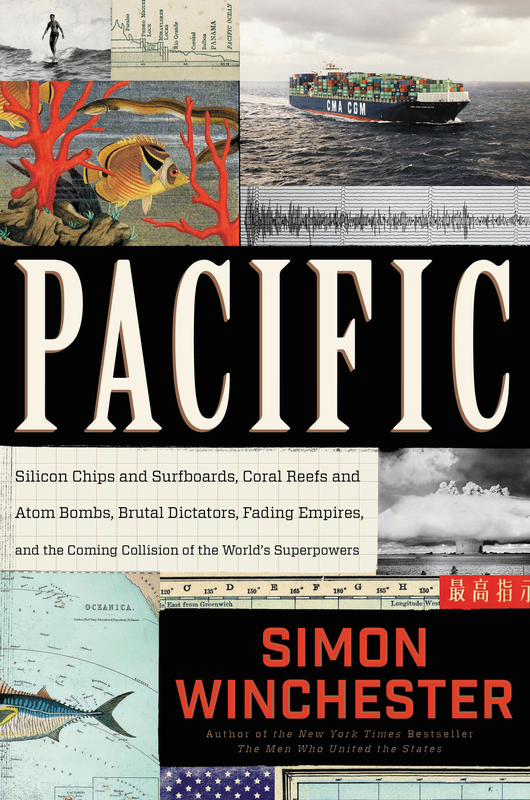 The Curious Wavefunction: Book review: Simon Winchester's "Pacific" - A "behemoth of eye-watering complexity"
Book review: Simon Winchester's "Pacific" - A "behemoth of eye-watering complexity"
I am always game for anything written by the prolific polymath Simon Winchester. His specialty is to dig up stories of entire geographic regions and/or the fascinating individuals who populate them. In the past he has written about the making of the Oxford dictionary ("The Professor and the Madman") and about the brilliant Joseph Needham who revealed China to the West ("The Man Who Loved China"). He has also written about the history of the Atlantic Ocean, and now he turns his sprawling attention to the Pacific. 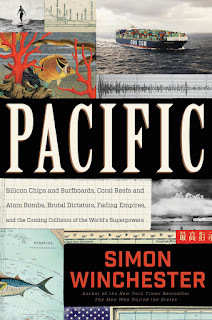 The Pacific, writes Winchester, "is a behemoth of eye-watering complexity". Its size beggars belief - its sixty-five million square miles can hold all the world's continents and still leave room for more - and its fringes and its heart contain some of the most important stories of science, history, geography and human civilization. How does one tackle an entity of such enormous scope and complexity? Winchester's tack is a neat one. What he does is tell us the story of the Pacific in ten diverse chapters. The subtitle of the book, "Silicon Chips and Surfboards, Coral Reefs and Atom Bombs, Brutal Dictators, Fading Empires, and the Coming Collision of the World's Superpowers" gives us a flavor of the myriad topics he takes on. The beginning of every chapter portrays a major event related to that chapter, which then becomes a springboard for a much broader theme. Here are some of the chapters that I found particularly interesting. The first chapter starts with a history of the hydrogen bomb tests in the countless tiny islands of the South Pacific which the US brazenly set off in the late 40s and early 50s. This series of tests leads to the real story, which is the sordid history and tragic exploitation of the native Pacific islanders populating these tiny islands: the Marshall Islands (including Bikini atoll where the first hydrogen bomb was detonated), the Solomon Islands (where John F. Kennedy almost died after his PT boat was sunk by a Japanese destroyer during World War 2) and the Marianas (which were the sites of some of the most ferocious battles of the war). The islanders essentially became pawns in the Cold War, and their constant uprooting and exploitation is a reminder of how forgotten people can almost be erased from history in the struggle between superpowers. Another chapter talks about how surfing took root in Hawaii and how, due to the efforts of a select few westerners - including writers Jack London - came to California and spawned a whole culture. There's also a chapter on the founding of Sony and the key role that Masaru Ibuka played in it (Akio Morita's role is usually better known). Winchester characteristically digs up amusing facts; for instance I did not know that Sony's transistor radios became big in the US after a highly publicized heist in which hundreds of them were stolen from a warehouse - while others were left untouched. A lot of the book is about the coming of age of Asian powers. One of the most interesting chapters is about the 1968 capture of the NSA spy ship USS Pueblo and its sailors by North Korea. That story provides a springboard into the exploration of the bizarre regime of North Korea and its highly repressive and otherworldly culture. Particularly illuminating is a brief history of the Korean War in which the boundary between the North and South was decided arbitrarily and literally on a whim by an American Colonel named Boneskull. And there's a description of one of the strangest places on the planet - the DMZ between the two countries where bears, exotic birds and other animals have thrived as in no other place on the planet. The capstone of the chapter is a bizarre dinner which the author has in the Swiss embassy which was formed to oversee the truce in 1952: a dinner that takes place with speakers in the background constantly blaring propaganda inviting South Koreans to live in the promised land under the beneficence of the Dear Leader. Just like the Pacific has been an enormous stage for geopolitical affairs, so is it also a great cauldron of geography and biology. One chapter tells us how - through its marshaling of El Nino and La Nina - the Pacific's heaving currents and underwater geography essentially control the entire world's climate. The same chapter also explores how ocean acidification caused by climate change is resulting in the destruction of the Great Barrier Reef's magnificent corals through a phenomenon called coral bleaching. Since I was at the reef only a few days back this chapter hit home. Perhaps the most elemental role played by the Pacific is illustrated through a chapter detailing the discovery of tremendous hot chimney like structures called black smokers which can generate life-giving nutrients in the absence of sunlight and which can sustain entire ecosystems of fascinating and bizarre creatures deep down on the ocean floor. The discovery of these smokers has revolutionized our understanding of the origin of life. Another chapter in the book talks about Australia and its amusing politics, especially the incident in the 70s when the Prime Minister Gough Whitlam was fired by none other than the Queen of England (technically her representative). Much of that chapter is about Australia's mixed legacy of alternately welcoming and shunning immigrants and also about the building of an iconic Australian symbol - Sydney's Opera House (which I have always found a bit underwhelming). Since I visited Australia just a few days ago I can attest to many of the things Winchester says about it. It's a beautiful country with very friendly people, but its nature is perhaps summarized by a remark made by one of Winchester's Australian friends: "Australia is a great country to live in, but it's not a great country yet". The last part of the book deals with an entity on the geopolitical stage which is undoubtedly going to loom large in the very near future - China. This is illustrated by one chapter which deals with the ceding of former colonial possessions in the Pacific to their rightful owners by former colonial powers. This is actually an inspiring chapter since it illustrates the waning years of imperialism. However one cannot but feel a bittersweet twinge of regret as Britain handed Hong Kong over to China. Britain had forcibly possessed Hong Kong from China during the Opium Wars of the 19th century, but it's also clear that in some sense China's governance of the island might be less benign than Britain's. China's assertive demands to take charge of Hong Kong in 1997, even as Britain had to meekly concede it, is illustrative of the power that that country has started to wield in the region. Winchester's ambivalence toward the trappings of this power are made clear in the last chapter when he talks about how China is gradually but surely expanding its military power by quietly building bases in the South China sea. While the West's withdrawal from the Pacific is a welcome sign of the end of centuries long imperialism in the region, China's authoritarian power and global plans make the peaceful future of the entire region uncertain. It was quite timely that I visited Australia right when I read this book. Through Winchester's narrative my appreciation of the key role that this mighty ocean has played in the fortunes of men, in the downfall of empires and in the sustenance of our planet - its very reach and its captivating romance - was enhanced. 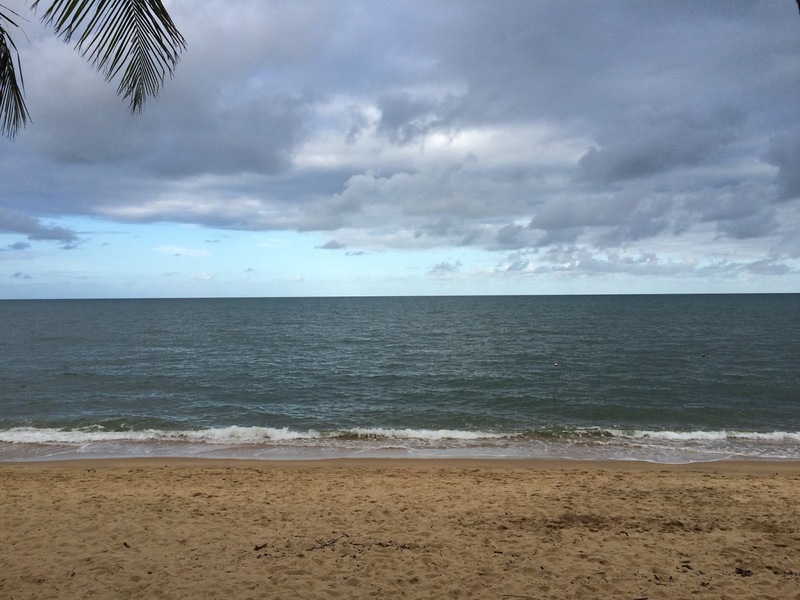 As I stood on the shores of Trinity Beach in Cairns (photo below) and contemplated the roiling waves, the billowing winds, the graceful palm trees and the beautiful but deadly jellyfish that lurked in the depths, my mind went back to the islanders on the Marshall Islands who, guided only by the stars and the wind, would have arrived on their tiny atolls tens of thousands of years ago and called them home. The same story of arrival and expulsion has played out over and over again in the Pacific. Which one of these tales prevails in the future is up to us.